PROMOTION OF THE government’s Ireland 2040 plan is estimated to cost about €1.5 million, Taoiseach Leo Varadkar said today – as the row over the government’s marketing of the national development plan again dominated Leaders’ Questions. Opposition politicians have claimed that articles placed in newspapers in recent days blurred the line between news reporting and advertising. The row over the rollout of the promotion plan received coverage on the front-page of last weekend’s Sunday Times, while its sister newspaper, the Ireland edition of The Times, reported yesterday that regional newspapers “were instructed not to make government advertorials look like independent stories”. Labour’s Alan Kelly and Fianna Fáil’s Timmy Dooley have called for officials from the Taoiseach’s department to appear before separate Oireachtas committees. Taoiseach Leo Varadkar insisted in the Dáil today that the government’s Strategic Communications Unit (SCU) did not have a final “sign-off” on the articles that ran in recent days. The Sunday Times reported at the weekend that some commentators interviewed for the pieces were not told they were being spoken to for advertorials. “If somebody is interviewed, as a general point, they should be told [if] they are being interviewed for a commercial feature,’’ Varadkar said today. 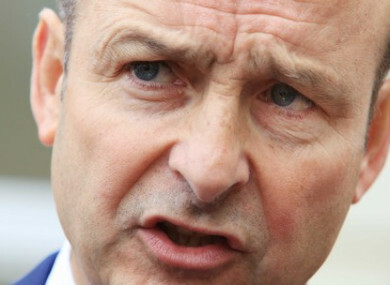 Fianna Fáil leader Micheál Martin raised the matter in the Dáil, calling out the advertising campaign as “a clear election pitch by any yardstick”. “In essence, it is using taxpayers money to advance and promote Fine Gael election candidates,” he said. “We have an independent media, thanks be to God, which is essential to the health of our democracy. The media needs revenue and we have no difficulty with advertisements that are clearly identified as advertisements,” said Martin. However, he said media content partnerships with the government need to be “fully transparent”. “Blurring of the lines” is how Martin described the rollout of the campaign. He also said civil servants working in the SCU (15 in total) have been politicised. The Taoiseach told the House the Strategic Communications Unit operates at an “arm’s length” from the government, and does so “in accordance with civil service code”. Varadkar hit back at claims that the marketing campaign of the Ireland 204o plan is the most expensive in the history of the State. The Fianna Fáil-Green Party coalition ran the most expensive campaign, the Taoiseach claimed, stating that the adverts around a climate change campaign during that time period cost €15 million. He said Fianna Fáil’s Transport 2021 campaign cost €3 million. Going to some effort to prove his point, Varadkar showed a sponsored ad from 2007 that included then-Minister Micheál Martin. “This campaign [Ireland 2040] will cost around €1.5m which is half the cost of the Transport 2021 campaign and a tenth of the cost of the climate change campaign,” he said. Ceann Comhairle Sean O’Fearghail addressed the Taoiseach and told him he had to obey the rules of the House like everyone else. It is against the rules to use props in the Dáil. The Ceann Comhairle is not happy and says the Taoiseach must obey the rules of the House, like everyone else, which includes no prop use in the House. “You have blurred the lines, you are going down a dangerous route, which ultimately has the potential to corrupt our democratic process itself, and it is about time you saw it,” Martin told the Taoiseach. “No one in the unit had any editorial sign off before they were published,” said the Taoiseach. He also said the unit played no role in selecting who would be interviewed for the articles, and “didn’t have final sign off in editorial content – that was signed off by the editors”. Email “'A clear election pitch': Fianna Fáil continues to hammer government over Ireland 2040 marketing ”. Feedback on “'A clear election pitch': Fianna Fáil continues to hammer government over Ireland 2040 marketing ”.